Victoria history goes back centuries, spans many cultures and nations and is just plain fascinating! Before the arrival of the Europeans in the late 1700s, the Victoria area was home to several communities of Coast Salish peoples, including the Songish (Songhees). Coast Salish refers to First Nation or Native American cultures who inhabited areas in British Columbia and Washington state. The Spanish and British took up the exploration of the northwest coast of North America beginning with the voyage of Captain Cook in 1776. The Victoria area of the Strait of Juan de Fuca was not explored until 1791. Spanish sailors visited Esquimalt harbor just west of Victoria in 1790 and again in 1792. In 1843, the Hudson's Bay Company was looking for a new location for its western base of operations. The company's chief factor, Sir James Douglas, liked Esquimalt Harbor, but rejected it as a site for a fort because there were too many trees there. Douglas chose a spot on the western shore of Victoria Harbor at the mouth of the Gorge Inlet. He called it Fort Camosun, after the "camosack," a type of wild lily native to southern Vancouver Island, but later renamed it Fort Victoria in honor of Queen Victoria. The Songhees established a village across the harbor from the fort. The Songhees' village was later moved north of Esquimalt. when the crown Colony of Vancouver Island was established in 1849, a town was laid out on the site and made the capital of the colony. The Chief Factor of the fort, James Douglas was made governor of the colony, and would be the leading figure in the early development of the city until his retirement in 1864. Gold Fever Strikes British Columbia Victoria! With the discovery of gold on the British Columbia mainland in 1858, Victoria history changed greatly as the city became the port, supply base, and outfitting center for miners on their way to the Fraser Canyon gold fields. The city mushroomed from a population of 300 to over 5000 literally within a few days. In 1866, when the island was politically united with the mainland, Victoria remained the capital of the new united colony and became the provincial capital when British Columbia joined the Canadian Confederation in 1871. Victoria was incorporated as a city in 1862. In 1865, Esquimalt was made the North Pacific home of the Royal Navy, and remains Canada's west coast naval base. In 1886, with the completion of the Canadian Pacific Railway terminus on Burrard Inlet, Victoria's position as the commercial center of British Columbia was irrevocably lost to the City of Vancouver. In a significant Victoria history course change, the city subsequently began cultivating an image of genteel civility within its natural setting, an image aided by the impressions of visitors such as Rudyard Kipling, the opening of the popular Butchart Gardens in 1904 and the construction of the Empress Hotel by the Canadian Pacific Railway in 1908. 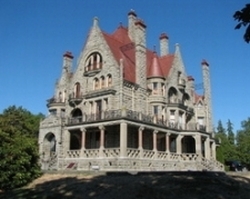 Sir Robert Dunsmuir, a leading industrialist whose interests included coal mines and a railway on Vancouver Island, constructed Craigdarroch Castle (photo on the right) in the Rockland area, near the official residence of the province's lieutenant-governor. His son, James Dunsmuir, became premier and subsequently lieutenant-governor of the province and built his own grand residence at Hatley Park in the present City of Colwood. The residence was used for several decades as a military college and is now the Royal Roads University. A number of municipalities surrounding Victoria were incorporated including the Township of Esquimalt, the District of Oak Bay, and several municipalities on the Saanich peninsula. Since World War II, the Victoria area has seen relatively steady growth, becoming home to two major universities. Since the 1980s the western suburbs have been incorporated as new municipalities, such as Colwood and Langford. The thirteen municipal governments within the Capital Regional District afford the residents a great deal of local autonomy, although there are periodic calls for amalgamation. There are many places of historical interest in Victoria, many of which are part of the many tours you can take around the city and its surroundings. From the Parliament Buildings and the distinctive architecture of the city's churches and historic cemeteries to the gun batteries of a former military fort and the mysterious turrets of an historic castle, Victoria history and interesting points always provide visitors with a very enjoyable visit.